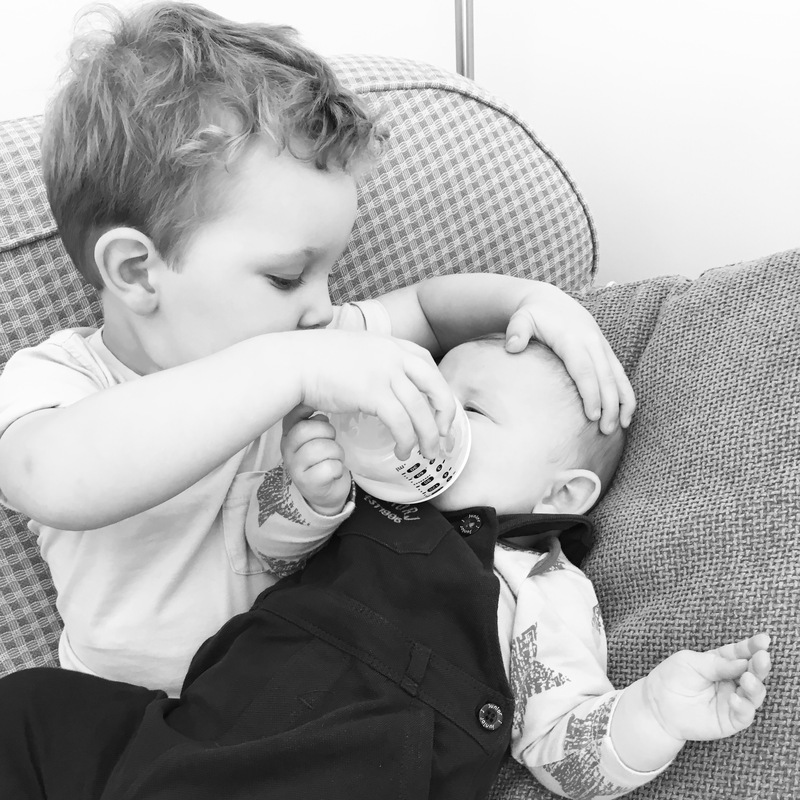 Our journey from breast feeding to bottle feeding has not been easy. It is by no means complete, but we have made progress so it is worth documenting. Honestly, I didn’t really think getting a baby to take a bottle was a real issue. I had heard about it before and thought it sounded tough, but didn’t think it was ever going to be something that happened to me. Especially with Arlo. From day one he has been a hungry baby. I knew I wanted to breastfeed him, like I had done for Woody, but also knew I would want to introduce a bottle at some point and move him onto formula when I needed and before I went back to work. We took the opportunity to try out the bottle when Woody was invited to a party at the end of June. I would be out of the house for 2 hours, leaving Rob to look after Arlo, and offer him a bottle of expressed milk if needed. It didn’t go well. Arlo screamed and screamed and wouldn’t take the bottle and just fell asleep. I didn’t panic at this point, it had taken Woody 3 days to get used to a bottle, so I thought I’d keep trying and it would happen in a few days. However, it didn’t just happen. Arlo would move the bottle around his mouth and not latch it. The week after our first attempt at the bottle, I had tickets to go and see Adele at Wembley. As the days approached this it became clear I wouldn’t be going (in the end Adele cancelled the concert so it made me feel better!!). We persevered with the bottle though. Trying nearly every day. And trying nearly every bottle. I had started with expressed milk, expressing everyday and feeding it to Arlo in a bottle. However, I don’t enjoy expressing and it messes with my milk supply, so I found this wasted milk frustrating. So, the Perfect prep machine came out and I made formula for every attempt. I had read that it was best if I was not the one offering him the bottle as he would be able to smell my milk and just wouldn’t want the bottle. We had friends and family try give him the bottle but that got us nowhere. As I was the one at home with him though, I was the one who offered him the bottle the most and I don’t think it made any difference. We started by using the Tommee Tippee closer to nature bottles. These are what we had used with Woody and I had a small unused one left over. When this didn’t work we then tried loads more. We tried a Nuby, a Mam, Avent and NUK. Trying multiple bottles can get expensive!! If you are in the same predicament, I would recommend messaging companies and asking if they would send you a bottle. NUK sent me their bottle free of charge and we had hope when Arlo tried this one as the teat is such a different shape, but it wasn’t for him. I did also have a response from Munchkin saying they would send me a bottle, but it never arrived. Otherwise, I bought single bottles when I saw them on offer! I’ll admit I had hoped he would go for the Mam bottle as you don’t need a steriliser to go with it, it sterilises itself in the microwave. So we have had a summer of bottle trying with no success. having to decline invites for anything involving being apart from Arlo. 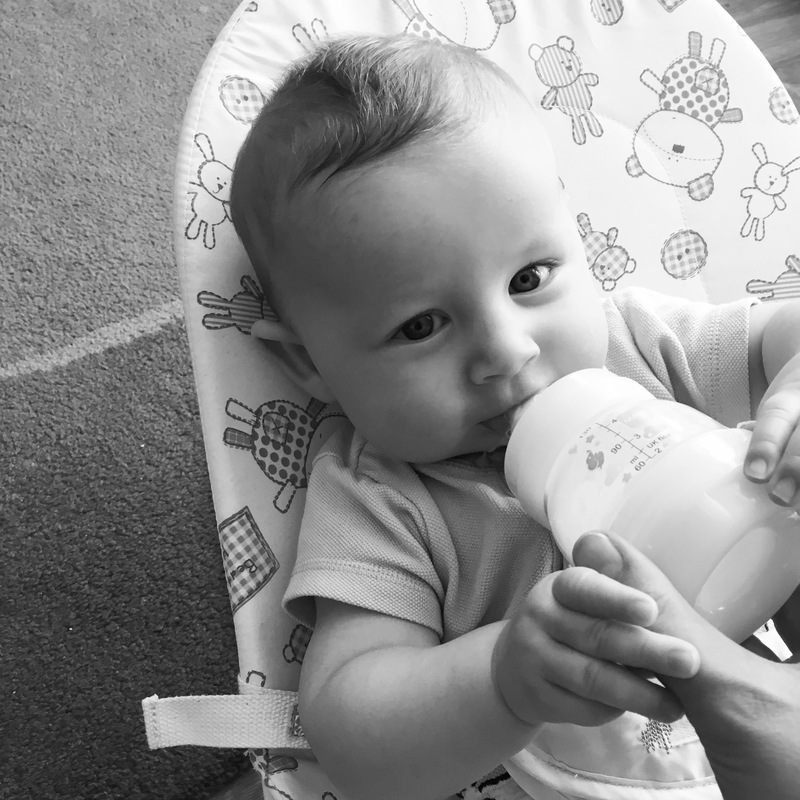 A lovely lady messaged me at the end of August after seeing my instastories following more failed bottle attempts and suggested trying the Tommee Tippee vari-flow teat – it had worked for her. This sounded like a good tip to me, so I got some ordered as soon as we were back from holiday. And after 3.5 months of perseverance, at the age of 7.5 months, success happened!!!! Last Friday night I had a mini breakdown after a long feed in the middle of the night. Having a baby so dependant on you can become quite overwhelming at times. At that point I had 4 weeks before going back to work full time. We were just planning to go cold turkey and see what happened. Not ideal, and not what the control freak inside me wanted. I had also been given dates of work nights away, girly weekends to be planned and another concert (Steps this time!!) in the diary which I was going to have to decline because I had to stay home to feed my baby (not make the decision myself that I couldn’t be apart from my baby- being in control of the decision is different!!). Arlo must have heard me that night and thought, ‘OK, it is time’. 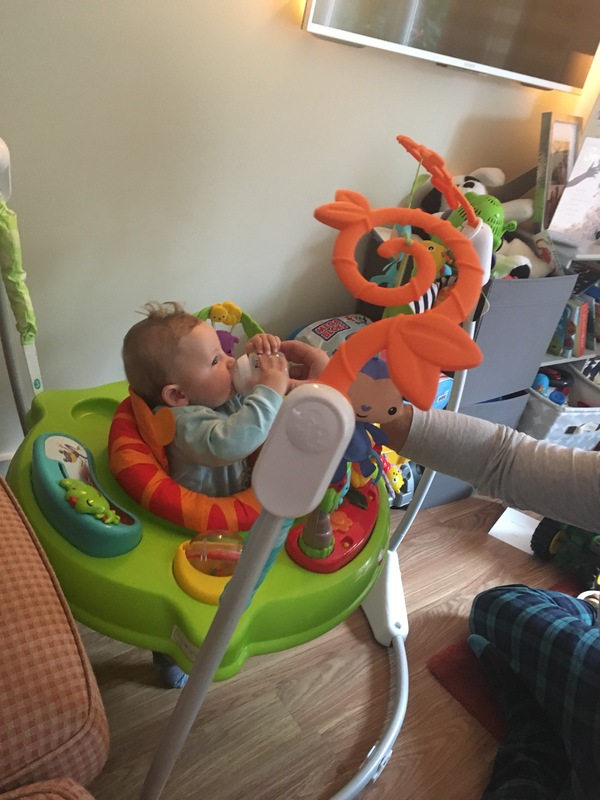 So when we tried the bottle last Saturday afternoon (whilst stood in his jumperoo), Arlo downed 4oz!!!! The baby who hadn’t really known what to do with a bottle finally drank from it! We felt like having a party!!!! And we have not given up since this day. Every afternoon feed this week has come from the bottle. The control freak in me has now jumped into action to get him weaned from daytime breastfeeding before I go back to work. We will do another week of afternoon bottles, and then increase this to morning bottle too. I have a plan, and there is nothing I love more than a plan. To anyone reading this who maybe in the same situation, the only advise I have it to persevere. We may have tried loads of bottles, with different shaped teats, but I honestly don’t think any of it made any difference. Sticking with it and hoping that one day it will all click was all we needed! Posted in Baby. Tagged 7 months old, Avent, Baby, bottle rejecter, bottlefeed, bottlefeeding, breast to bottle, breastfeeding, Closer to Nature, Mam, Munchkin, Nuby, NUK, tommy tippee.